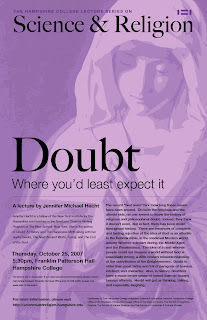 As part of Hampshire College Lecture Series on Science & Religion, we will have Jennifer Michael Hecht on October 25th for a talk titled, Doubt - Where you'd least expect it. She is a historian of science and is the author Doubt: A History, The End of Soul and The Happiness Myth. She is also a poet and her poetry books include The Next Ancient World and Funny. I read Doubt last year, and its a very well-written book. Her chapter on Muslim and Jewish skeptics of the Middle ages is fascinating and I think she will be touching a bit on that in her talk at Hampshire College (Added: you can also listen to a podcast of her interview on Speaking of Faith - thanks to Nizam for the link). If you live in/near western Massachusetts, please join us at the lecture. As usual, we will also be recording the lecture and I will post the video when its available. The recent "God wars" hide how long these issues have been around. On both the religious and the atheist side, no one seems to know the history of religious and philosophical doubt. Indeed, they think it doesn't exist. But in fact, there has been doubt throughout history. There are instances of complete and lasting rejection of the idea of God or an afterlife in the Hebrew Bible, in the medieval Moslem world, among Western scholars during the Middle Ages and the Renaissance. The idea of a past wherein people could not imagine a world without God is essentially wrong, a 20th century misunderstanding of the contribution of the Enlightenment. 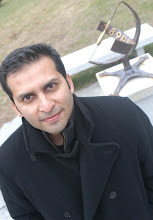 Doubt is older than most faiths and full of paragons of bravery, intellect, and character. Also, in history, doubters have a much better sense of humor than do today's famous atheists. Hecht will get us thinking, talking, and especially, laughing. I wish I could be there in person, but I'm looking forward to at least being able to see the video afterwards. Thanks for the link. I have added that to the post. Nova episode on Intelligent Design!